New analysis suggests that domestic dogs evolved from European wolves that interacted with human hunter-gatherers. Gray wolfWIKIMEDIA, MARTIN MECNAROWSKIDomestic dogs evolved from a group of wolves that came into contact with European hunter-gatherers between 18,800 and 32,100 years ago and may have since died out. This origin story comes from a new study that compares DNA from dozens of dogs and wolves, including 18 ancient fossils. The results, published today (November 14) in Science, provide the clearest picture yet of where, when, and how wild predators came to be man’s best friend. 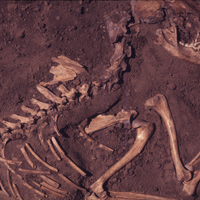 The new paper follows two earlier studies that looked at the genetic signatures of domestication in dogs, and came to differing conclusions about canine origins. One group suggested that dogs were domesticated around 10,000 years ago during the Agricultural Revolution, when wolves started scavenging human scrap heaps. 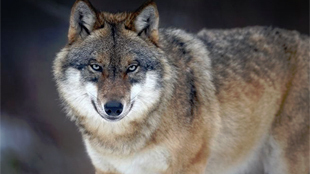 Another concluded that wolves and dogs split 32,000 years ago, somewhere in East Asia. Both studies compared the genes of a wide variety of living dogs and wolves, but modern samples can be deceptive. Dogs and wolves diverged so recently that many of their genes have not had time to separate into distinct lineages. They have also repeatedly hybridized with each other, further confusing their genealogies. 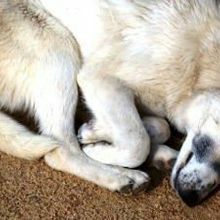 To deal with these problems, a team led by Olaf Thalmann from the University of Turku in Finland analyzed mitochondrial DNA from 18 fossil canids. They compared these ancient sequences to those from 49 modern wolves and 77 modern dogs, and built a family tree that charts their relationships. The tree conclusively pinpointed Europe as the major nexus of dog domestication. It identified four clades of modern dogs, which are all most closely related to ancient European canids rather than wolves from China or the Middle East. “We didn’t expect the ancestry to be so clearly defined,” Thalmann told The Scientist. “This suggests that the population of wolves in Europe that gave rise to modern dogs may have gone extinct, which is plausible given how humans have wiped out wolves over the centuries,” he added. According to this new tree, the largest clade of domestic dogs last shared a common ancestor 18,800 years ago, and collectively, they last shared a common ancestor with a wolf around 32,100 years ago. They must have been domesticated at some point during this window. These molecular dates fit with fossil evidence. 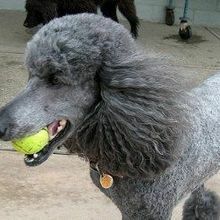 The oldest dog fossils come from Western Europe and Siberia, and are thought to be at least 15,000 years old. By contrast, those from the Middle East and East Asia are believed to be 13,000 years old, at most. “The archaeologists would be happy,” said Larson. The dates also make it unlikely that dogs were domesticated during the Agricultural Revolution, which took place millennia later. Instead, they must have first associated with European hunter-gatherers. They may have assisted humans in bringing down large prey, or could simply have scavenged leftover carcasses. Either way, their association with humans grew stronger and stronger, until they eventually evolved into domestic dogs. However, Thalmann acknowledged that his team’s analysis does not include any ancient DNA from the Middle East or China, nor nuclear DNA from any of the fossils. In other ancient DNA studies, nuclear DNA sequences have revised the evolutionary stories told by mitochondrial ones. 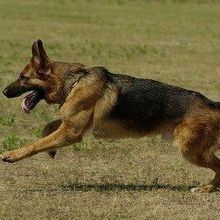 “Who knows what we would find if we had ancient canid samples from East Asia or elsewhere, or were successful in amplifying nuclear DNA from ancient canids,” said Adam Boyko from Cornell University, who was not involved in the study, via email. “But that shouldn't detract from the great work they were able to do here,” he added. Indeed, Thalmann’s team showed that the famous Goyet dog—a 36,000 year old Belgian skull, supposedly belonging to the oldest known dog—is not directly ancestral to modern dogs. Instead, it represents an ancient sister lineage that died out. The same is true for other old specimens from Belgium and Russia’s Altai Mountains. “Maybe they were trial domestications that were not successful,” said Thalmann. O. Thalmann et al., “Complete mitochondrial genomes of ancient canids suggest a European origin of domestic dogs,” Science, doi:10.1126/science.1243650, 2013.